Rainbow Owls custom ordered for two lucky little girls. First, a little family history. My grandmother is a seamstress. Not in the way that most people’s grandmothers are seamstresses, though. She worked for Bob Mackie and Nolan Miller. So while my friends’ grandmothers were making dresses for their Barbie dolls, my grandmother was making dresses for Cher and Carol Burnett. My abuelita came to this country as a Mexican immigrant with very little. And, like most people who grew up poor and having to do without, she was (and is) very careful not to waste things. So it really bothered her to watch scraps of beautifully beaded lace swept up with the trash at the end of every work day. In fact, it bothered her so much that she would collect these scraps and bring them home. To this day, she has dozens upon dozens of tiny jars filled with beads that she cut free from these scraps and then sorted in her limited free time. When I picked up a needle for the first time since childhood, I was a graduate student in need of a hobby to help me unwind (and give me something to do during Minnesota’s brutal winters). I was far from my home in Los Angeles and terribly homesick. I think that sewing made me feel a little more connected to my home and my family. Picking up a needle wasn’t easy. My grandmother had tried to teach me how to sew when I was a kid– but I wasn’t very good at it and she wasn’t very patient. So I abandoned the trade and, in the subsequent years, forgot almost everything she’d taught me. Now, more than twenty years later, I found myself buying a “how-to” book to teach myself some basic stitches and wishing that I’d had more perseverance as a child. The first projects I remember being really proud of were felt sugar skulls. A friend of mine liked them so much that she offered to sell them in her boutique candy shop during the Halloween/Day of the Dead season. They were a hit. I couldn’t believe that people were actually willing to pay for something I had made with my hands. Feeling gratified and encouraged by my modest success, I opened up a little Etsy store and started selling other pieces of my artwork. Everything I made was a reflection of who I was and of my family’s immigrant experience. 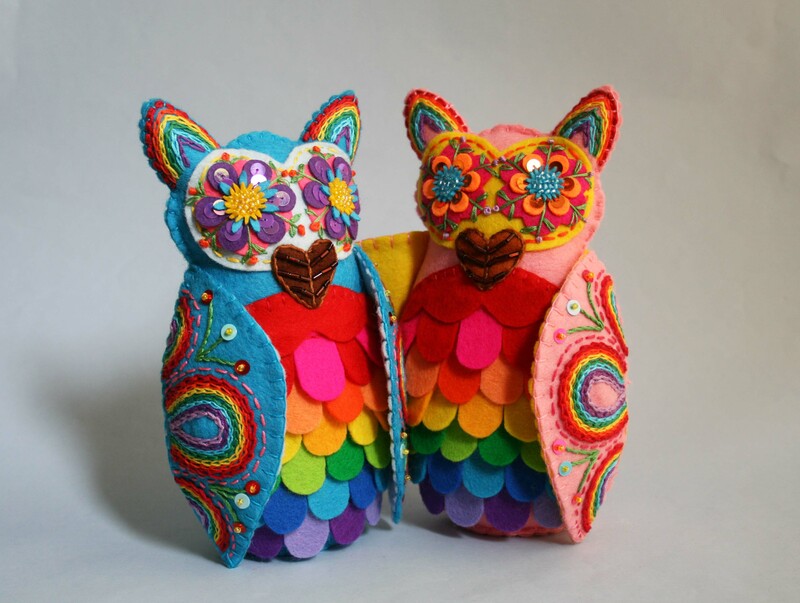 The felt owls that I have submitted for your review are inspired by the brightly painted owls crafted in Southern Mexico. Many of them boast a “sugar skull” tummy panel in homage to their Mexican roots. They are cut from 100% wool felt and are completely hand stitched and embroidered. Best of all, they are embellished with the beads and sequins that my grandmother “rescued” from Bob Mackie’s studio floor. I like to think that these owls represent what can be done when you don’t give up on learning. I hope that you like them.